Maple Madness is setting in early this year. I caught the boiling bug early. it must have been my recent exposure to the new enhancement accessories Leader made available for their Half Pint “backyard” evaporator. Oh how sweet it would be, if only I had more trees. I could make twice as much syrup in a little under half the time and pretend to be a big boy boiler. Ah well, I just can’t get enough sap to even begin thinking about extending the arch. Although the new drop flue pan is feasible I’ll stick with my original flat pan. It does the job. With 30 taps my Half Pint evaporator is just what I need to “quickly” boil down the daily sap collection. While the initial equipment investment was relativity high I’ve found the biggest investment I’ve had to make is time. To make a gallon of syrup requires roughly 8 hours. Now that I’m retired I can finally afford the time. I boil the most of the season because I want to make as much syrup as I can. With 30 taps I can make 10+ gallons of syrup. I quit after making a couple days of darker syrup when the sap starts to turn at the end of the season. That much syrup really doesn’t go far between satisfying my syrup cravings, maple cream addiction and not forgetting maple syrup makes a sweet gift. Looking at the pan photo you’ll see the results of a day’s boiling. I’ve got near syrup in the right side of the pan but no more sap. I let the fire go out when the sap level in the pan gets about an inch deep. The residual heat is enough to boil away another 3/4 inch if I time it right. That’s a dangerously low level so I keep a couple gallons of sap in reserve just in case the pan stays too hot. If it cools too fast, a couple short “kindling” fires may be needed to leave 2 – 3 gallons of near sap left in the pan by the time it’s cool enough to handle. For me the Half Pint evaporator isn’t quite a full service arch. By that, I mean I don’t finish off syrup directly on the arch. With 30 taps I don’t have enough sap to boil down all the way to syrup in the 2 x 3 foot pan. I get near the point where I could start to draw off finished syrup but by then I’m out of sap. Here is where the method of finishing off diverges. With enough sap and a long day’s boil it’s possible to draw off some syrup before shutting down. When you run out of sap let the fire go out and let the sap stand overnight in the pan. The next day resume boiling reversing the sap flow in the pan. (just move the reservoir pan to the opposite end of the finishing pan). Reversing the sap flow allows the fresh sap to dissolve the niter deposits that were made on the syrup section of the pan on the previous day. Note, the graduated sap in the separate channels will blend together overnight. Before you stop for the day, draw-off about a gallon of almost finished syrup into a container and cover. The next time you boil add it back into the finishing section of the pan after a good boil is established. That brings me to my method. I normally keep the boiling sap level a constant 2.5 inches deep. Once I’m out of sap I keep a fire hot until that level lowers to an inch. At the one inch mark I let the fire go out and let the residual heat slowly evaporate the sap. The arch stays hot quite a while and will evaporate another 1/2 inch or more. Always keep a couple gallons of sap in reserve just in case the pan starts to go dry. Once the arch is cool enough to touch, I drain the pan. It requires lifting and tilting the pan to get all the sap out which I filter into a stainless steel bucket. I immediately refill with water to just over the boiling sap level and the deposits made there. I add a cup or so of kitchen vinegar The next day I add hot water if it’s iced over and clean the pan with a soft dishcloth. It doesn’t take much elbow grease to remove the mineral deposits. Rinse, rinse and rinse again. Ready for another boil. Finishing syrup my way means a lot more cleaning up. Managing the fire is extremely critical when you boil down to such a dangerously low level. Let the fire go out too soon and it’s no big deal. Wait too long and you could scorch the pan. Why the hard way? I want very lightest syrup I can make. Not that dark syrup is bad, it tastes stronger and many people prefer a darker syrup, including myself. Dark syrup is also great for cooking. What dark syrup won’t do is make maple cream. There’s something about the concentration of minerals or something that impedes proper crystallization. Most of the syrup I make is turned into maple cream which by the way I believe is best eaten with a big spoon. The daily cleaning certainly helps keep my pan pristine by removing the daily niter build up. It might also contribute to a better quality syrup. Each day that niter is removed and not allowed to build up. Remember, when you reverse the sap flow the previous day’s niter is dissolved by the fresh sap and deposited in on the far side. Now imagine how much would actually build up over multiple days of boiling. A neighbor with a similar set up uses the normal method. His syrup is dark and tasty but won’t make maple cream. Part of the reason is the sap is boiled longer and the continual concentration of impurities in the pan doesn’t help either. EDIT: Learn something new each day update. I thought there may be other contributing factors to why my friend’s and neighbor’s syrup turns out darker than mine. After reading a study I’m thinking bacteria plays a much larger role in turning the syrup dark. Testing basically proved the more bacteria in the sap the darker the syrup turned out. That’s something I didn’t know. All I really knew is sap will go bad quickly once it gets over 40 degrees F. At some point the bacteria will more than make the syrup darker, it will also make it taste off or bad. Don’t get concerned, there’s always going to be some bacteria in the sap but the finished product is completely sterilized. Think about it, Milk is pasteurized while maple syrup is Hell Fired. The people I know who are making dark syrup are also storing sap, sometimes for days. One has more taps than he can keep up with, others store sap until they either have the time or enough sap for a long boiling day. Leaving sap sit, even in the “cold” allows bacteria to grow. I’m now guessing that boiling time isn’t the only reason their syrup is turning out darker than mine. They’re boiling the sap long before it goes bad but now I wonder if the bacteria concentrations in their sap are reaching a level where it effects the syrup color. Actually running the arch is very easy. Fill the evaporation pan to the desired boiling level and start a fire. A good rule to follow is fill the firebox 3/4 full and never let it go under 1/2 full. It is best to cross stack the firewood, it allows plenty of space and air flow for a hotter fire. For a good hot fire keep pieces of wood under a 3 inch diameter. Keep the fire stoked and the firebox door open as short as possible. It’s easy to lose a roiling boil by being too slow while feeding the fire. Adjust the air intake door as needed. I’ve never had to open the air intake beyond the first notch. If there’s one place on Earth you want to be hot as Hell, it’s in the arch. The Half Pint flat pan is rated to evaporate 4 to 6 gallons per hour. A smoldering fire won’t reach the lower level. 7+ is possible using very dry wood split under a 2 inch diameter and stoking the fire like crazy while keeping the boiling level a bit lower. Fill the reservoir tank about 2 inches to the top. Once a good hard boil is established open the valve on the reservoir tank to “dribble” fresh sap into the evaporator pan. Adjust the dribble of sap to keep the boiling level constant. The fire and the level of sap in the reservoir will effect dribble rate and it’s best to keep them both constant to minimize fiddling around with the reservoir draw off valve. A good roiling boil is going to make foam. Foam decreases the evaporation rate and can overflow the pan. Keep the foam down using a bit of butter or a drop or two of defoamer. I scoop out scummy foam accumulations with a small kitchen strainer. Most of the time is still taken up by standing around watching sap boil. Never leave a boiling pan unattended for long. That’s one thing you don’t want to learn the hard way. I set the arch on a platform made of 2 x 6 lumber covered with sheet metal. Hot coals do drop out of the firebox. Because I keep the arch in the concrete floored garage I set the platform on 2 inch PVC pipe used as rollers. The arch is rolled to the door, the platform is then levered (using a bar and a piece of 4 x 4 as a fulcrum) up off the rollers and set on bricks. Shim as necessary to level the arch. The arch is under cover with the stack running out and up over the garage roof. Just to be doubly safe I temporally put up a sheet metal heat deflector on the garage above the door. There’s not much head room under the garage door for the steam that comes off the pan. I use a new tarp to let the water vapor condense on instead of the dirty door. I angle the tarp as much as possible so the condensation runs off to the sides and doesn’t drip back into my pan. When the season is over I lower the arch back onto the rollers and move it out of the way to the back of the garage. 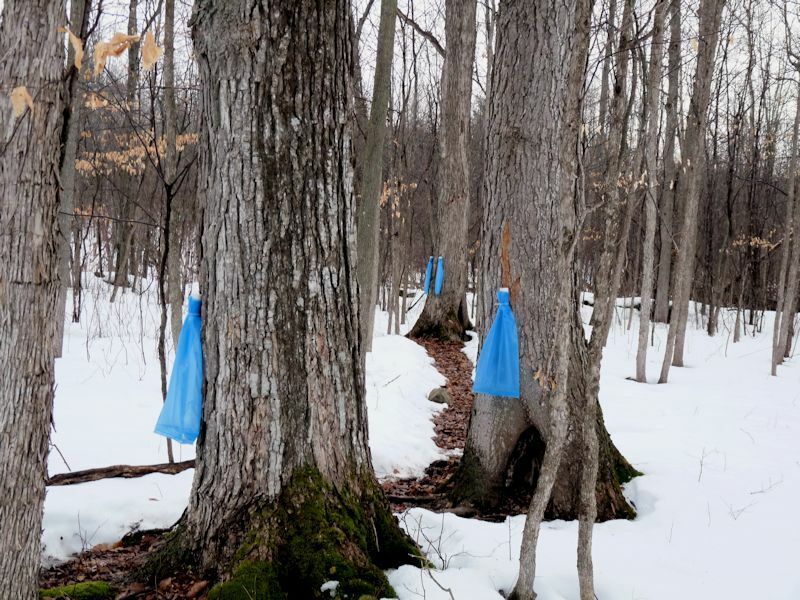 Hanging sap bags using homemade holders made out of two inch PVC pipe. This is fascinating. I once watched a TV show about making syrup like this. I found out from that show that all the syrup I’ve had from the stores in my life wasn’t the real stuff. It still didn’t occur to me to look for some real syrup. After reading this I think I’ll check online for some.